A row has broken out over research that suggested large numbers of free ranging salmon are being killed by parasitic sea lice in European waters every year. The international study involving the University of St Andrews said the parasite was responsible for an average of 39% of all salmon deaths at sea. Angling groups claimed this confirmed the impact of fish farms on salmon. The Scottish Salmon Producers’ Organisation (SSPO) and St Andrews have now clashed over the results. The SSPO has written to the university demanding a retraction of the press release issued to publicise the research, and also an apology. The organisation said ocean mortality of salmon was widely recognised to be at more than 95%, with sea lice representing 1-2% of deaths according to previous scientific studies. 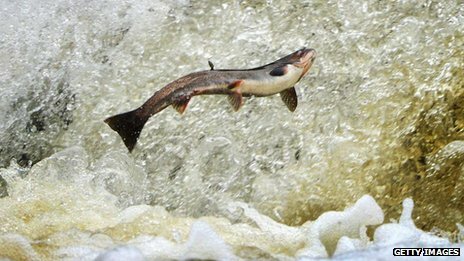 It added that declines in numbers of wild salmon to Scottish rivers to spawn had affected the east coast, where there are no salmon farms, as well as other parts of the country. Prof Phil Thomas, chairman of SSPO, accused the university of making “a major blunder”. The University of St Andrews said it stood by its part in the research and its press release. WILDLIFE NEWS and ART Blog at WordPress.com.